We are still in the upper room with Jesus and His disciples eating the Passover supper. When I looked at the topic I wanted to shake those boys! Today! Of ALL the days they had with Jesus, they picked THIS day to argue over who was the greatest! They didn’t have our perspective on this day, but of all the days to have this argument. Luke is not the greatest at giving us a linear timeline in his account of Jesus’ life. We jump around timewise but follow topically instead. I’m wondering when this conversation took place in the dinner. Did it happen before Jesus broke the bread and passed the cup? 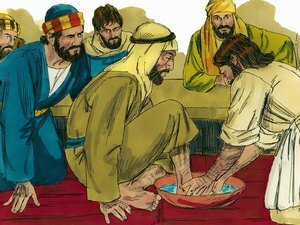 Did it happen before He washed their feet? What was going on when this “dispute” broke out? Or could Luke actually be referencing another time when this discussion arose? Jesus used a very clear object lesson for this discussion. Jesus Himself was serving His disciples during this dinner. He even went so far as to wash their feet during the Passover supper. That was the job of the lowliest servant in the household, yet the King of Kings performed this task for His followers. He demonstrated how He wanted them to minister to His followers, His Church, His Body, His Bride, after He left. He wanted them to do more than look out for their wellbeing through money or government channels, but to get in and get their hands dirty ministering directly to the needs of the people. Every act Jesus undertook was in service to us as well as obedience to His Father. He did the jobs that none of us could do. He paid the ultimate price for us. Because of Jesus willingness to serve He was elevated by His Father. God placed everything under Jesus’ feet. God Himself will also in essence serve Jesus. This happens when God tells Jesus, “Sit at my right hand until I make your enemies a footstool for your feet” (Psalm 110:1). God serves His Son by completing this final work in preparation for Jesus’ Kingdom rule. Jesus promises His disciples that they will be elevated too for their service. He promises them a reward for their service to Him too. For standing by Him in His trials. He knows they won’t be by Him during His final ordeal but they will be back. This has been prophesied from the beginning. All but one of His disciples have faithfully stayed with Him through everything He has endured. I wonder if Paul is the one sitting on the twelfth throne. Father God thank You for Your service. Lord Jesus I can never pay You back for Your service. I desire to serve as You do but I know I can’t even get close to the degree You serve with. Not “served” but “serve.” You are still serving today. Thank You that You still meet my needs personally. Thank You that You don’t get exasperated with me. You didn’t “Gibbs slap” Your disciples when they started this argument during Your final meal together. You loved them even when they were acting like children. I’m sure I deserve a “Gibbs slap” at times too. Thank You for Your patience with me. Help me serve with the same kind of love You use. The same kind of patience. The same kind of example.